This week's selection of archive clips are a curious melange of televisual goodness and should herald the start of a fantastic weekend. Well, at the very least, you'll learn about outdated encryption methods and that's surely better than anything else you've got planned, right? I recently found a BBC engineering test on a VHS tape and it was one of the strangest things I'd ever witnessed. They're not easy things to track down, but a few have turned up over the years such as this one which was, most likely, an early test for the BBC Select subscription service which would run between 1992 - 94. The picture and sound is clearly scrambled and this is thanks to the Discret 12 scrambling method mostly used in France. Footage featured in this engineering test includes Showaddywaddy performing on Top of the Pops, Gardener's World and the 1974 FA Cup Final between Liverpool and Newcastle. Just imagine finding this on your screen early in the morning. A true rarity of British television and an intriguing look at the initial steps taken towards launching the BBC's ill fated subscription service. British wrestling has recently returned to ITV's screens for the first time in 30 years, but here's a look at what was going on back in 1980 to celebrate 25 years of wrestling on ITV. 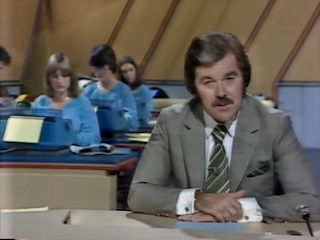 Dickie Davies presents an opening link from the World of Sport studios (complete with women on typewriters in the background) before handing over to Kent Walton at ringside. And, yes, Young David from Warrington would later go on to become Davey Boy Smith aka The British Bulldog. His son, of course, stars in the newly established World of Sport wrestling federation. This BBC1 junction features plenty of archive gems and starts with a slide promoting the new series of Roy Castle Beats Time (nope, I'd never heard of it either) before the really exciting footage makes its way into our eyestalks. And that footage is a trailer for a forthcoming episode of Play Away featuring a number of stills from the episode, so, yes, there's plenty of Brian Cant to marvel at. Following this, there's an incomplete edition of John Craven's Newsround to truly put the cherry on top of the childhood nostalgia cake. This year's World Cup has been and gone, but it will always be in our memories as will this infamous World Cup match from Mexico '86. Not only did it feature the hand of God and one of the finest goals in football history, but the BBC coverage was stellar. From the sublime opening titles through to the in-studio team of Des Lynam, Emlyn Hughes and Terry Venables it's an amazing slice of retro football goodness. And I haven't even mentioned that Bobby Charlton is reporting from in the stadium. Apologies that you can't watch this video directly on here, but that's down to the video owner's settings. You can click the 'Watch this video on YouTube' link to watch it on YouTube. Not entirely sure if this is from 1986 or 87, but I am certain that Chris Barrie is excellent in it. It's the intro from an episode of Saturday Live and after mucking around outside the studio, he heads inside to perform some of his magnificent impressions. People say that Coogan is an outstanding impressionist, but Barrie is easily just as good. I probably watched that link in the spring of 1975,and I can certainly remember that scrambled engineering test that featured sequences from the year before!